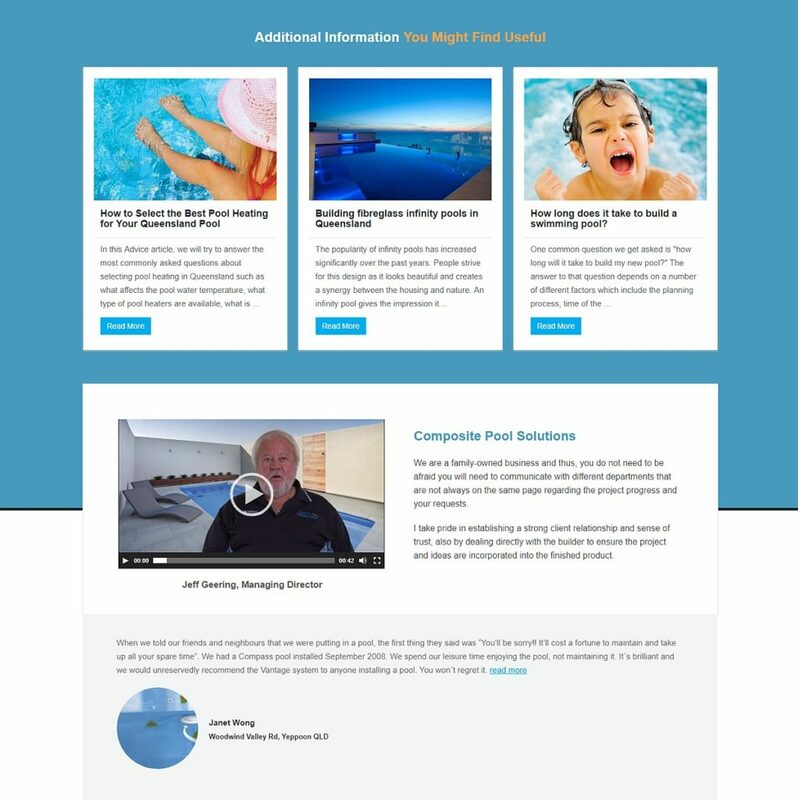 It all started with the website, as Composite Pool Solutions needed a new one. Our cooperation goes on, though and we work on digital marketing campaigns covering email marketing, PPC, and Facebook. New content pages created by us represent an important part of the project as they often serve as landing pages for the campaigns. We also develop the local content structure to increase rankings in local search. Finally, new pages about relevant pool topics are being created to boost SERP positions for numerous niche keywords. 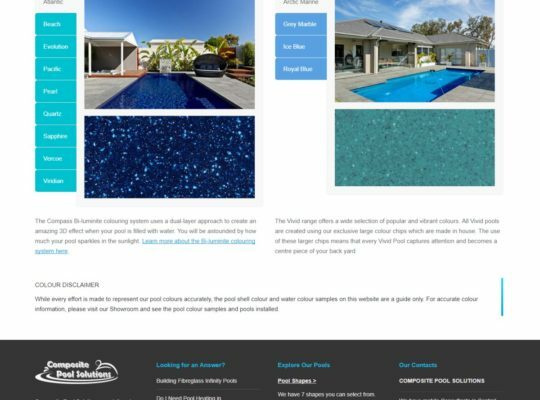 Composite Pool Solutions is a family owned Queensland pool builder specialising in fibreglass swimming pools. Jeff Geering, the owner, is well known for his professionality and attention to detail. Moreover, he travels a lot and because of that, he is able to cover a vast region of Central and North Queensland. 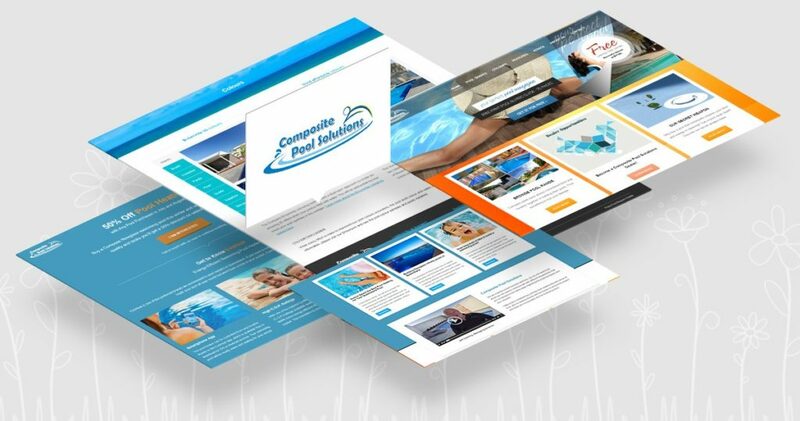 The website is used mainly by prospective customer, the future pool owners. They will learn what it takes to build a pool and get all the information they need to make the decision. 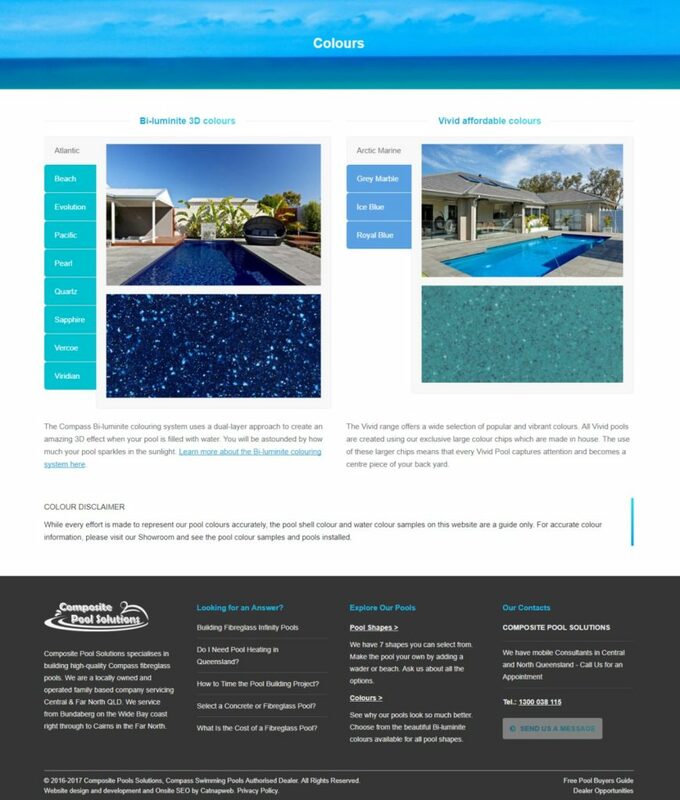 The website is content rich, presents fibreglass pool shells, colours, features of Compass fibreglass pools and much more. Advice section is an important compound presenting organised knowledge regarding deciding about the pool, pool planning, pool project, and swimming pool maintenance. 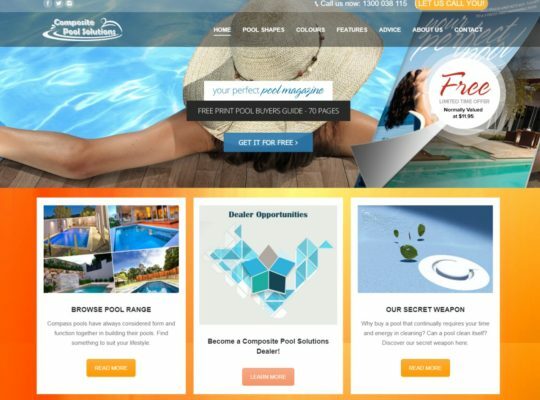 We created a new website that could present the luxury and high-quality products Composite Pool Solutions sell in an adequate way. 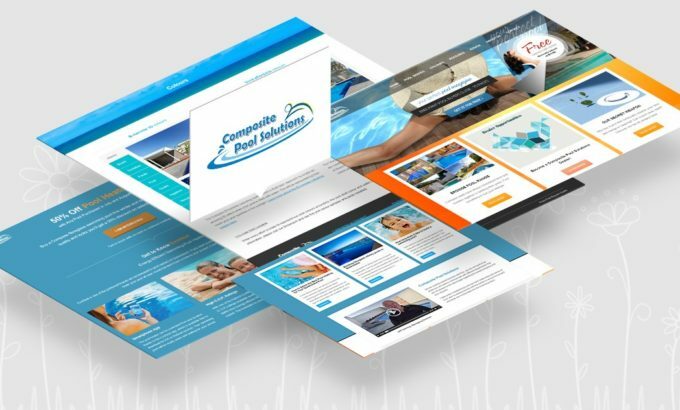 The homepage has a lot of content to promote different parts of the website and helps increase the pages per visit ratio. Several call to actions are present in different places across the website to enable people looking to buy a pool to get in touch with Jeff and his team. We have worked on two types of landing pages. 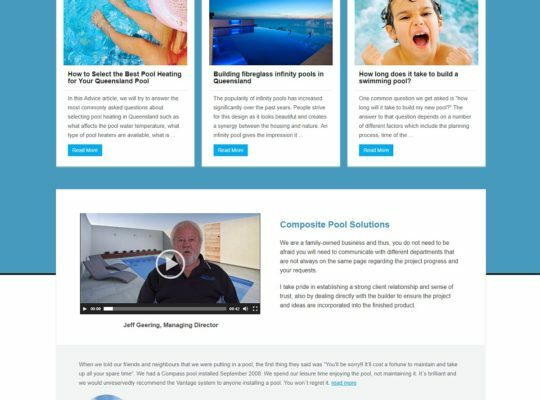 Firstly, we are covering content people search for when deciding to buy a pool. These include e.g. 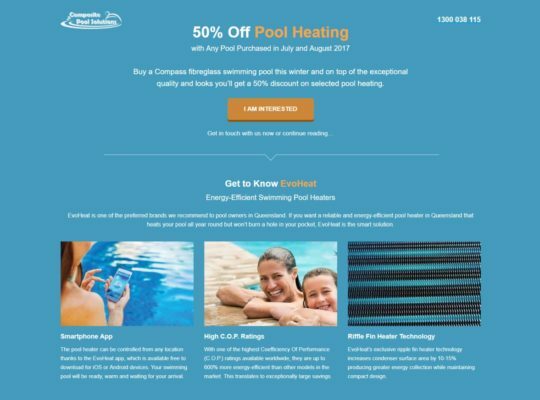 pool materials, pricing, pool types including infinity pools, pool heating etc. Secondly, we have created campaign landing pages that are optimised for conversions. Facebook PPC, Facebook boosted posts, PPC in Google and Mailchimp campaigns lead to these pages. We created the ideas for promotions, designed them, prepared the campaigns in different media, run and optimized the campaigns to increase conversions. MailChimp newsletters to existing leads were accompanied by Facebook Ads and Google PPC. Campaigns have been changing every couple of months. We have decided for a “low-pace” continuing SEO project that would help to build visibility and authority for the topic-focused keyword sets. For example, we are working on visibility for the topic of infinity pools, pool heating or heat pumps. The big challenge is to ensure local visibility because CPS covers such a vast region of Central and North Queensland with many distant cities and areas. Constantly improving visibility for defined keyword groups such as Infinity Pools. 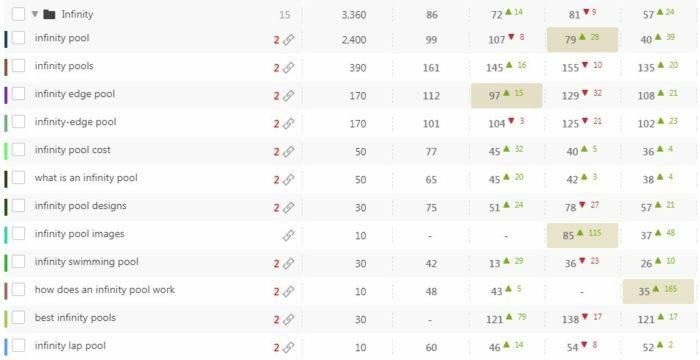 In four weeks we have improved SERP rankings for all keywords but still there is some time needed to get into TOP10 for some of them. We work similarly with other identified groups.